Inclement weather has resulted in a slew of closures and cancellations in the area. Here's the latest for Wednesday, Feb. 13, and beyond. As the Seattle area digs out from record-breaking snow, hazardous conditions remain a problem and are leading to closures and cancellations around the region. Seattle Public Schools are closed. The following school districts also are closed: Arlington, Bellevue, Bellingham, Bremerton, Burlington-Edison, Central Kitsap, Concrete, Darrington, Edmonds, Enumclaw, Everett, Federal Way, Ferndale, Granite Falls, Highline, Hood Canal, Index, Issaquah, Kent, Lake Stevens, Lake Washington, Lakewood, Lynden, Marysville, Mercer Island, Meridian, Monroe, Mount Baker, Mukilteo, North Kitsap, North Mason, North Thurston, Northshore, Olympia, Orcas Island, Peninsula, Port Angeles, Renton, Riverview, San Juan Island, Sedro-Woolley, Sequim, Shelton, Shoreline, Skykomish, Snohomish, Snoqualmie Valley, South Kitsap, Southside, Stanwood, Sultan, Tacoma, Tahoma, Tukwila, Tumwater, University Place, Vashon Island, White Pass, Yelm. 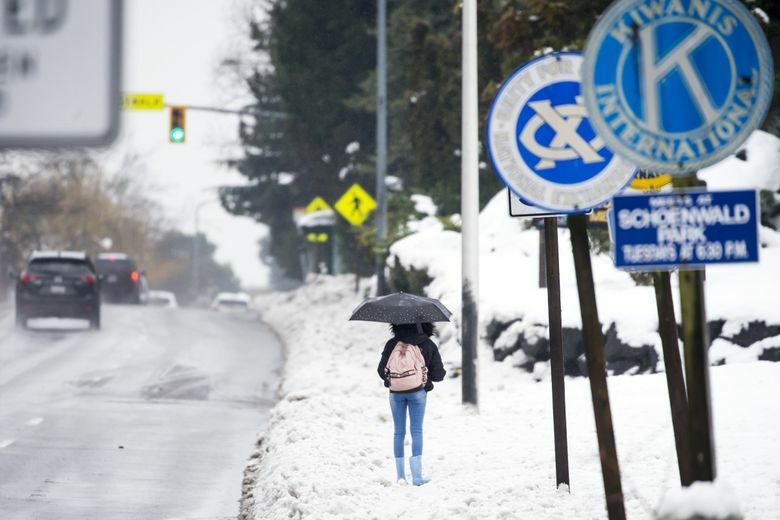 The University of Washington’s Bothell campus is closed. The Seattle and Tacoma campuses open at 9:30 a.m.
Bastyr University, Seattle Pacific University and Western Washington University are starting late. Seattle University is open. Evergreen State College is closed. South Seattle College is closed. Shoreline, South Puget Sound, Tacoma and Whatcom community colleges are closed. Many other area colleges are starting late. Seattle Public Utilities will pick up residential garbage for Monday and Tuesday customers on Wednesday. Crews will also try to collect recycling from Monday customers in parts of northwest and southwest Seattle. Customers may put out twice as much garbage as usual for no extra charge. If Monday or Tuesday is your usual pickup day and your trash isn’t collected Wednesday, it will be collected at its usual time next week. For the rest of this week, garbage pickup will be on a one-day delay — for instance, if yours is usually collected on Wednesdays, it will be collected Thursday. SPU asks customers to clear snow and ice from around their cans so crews can access them. Customers may also bring waste to transfer stations for free Feb. 13-16. More details here. Republic Services won’t collect solid waste in Renton on Wednesday. The Museum of Pop Culture (MoPOP) will open at noon. The Woodland Park Zoo is open on regular hours, 9:30 a.m. – 4 p.m.
Seattle Public Libraries intend to be on regular hours Wednesday but will post any reduced hours online at 9:30 a.m. The Frye Art Museum is closed on Wednesday, Feb. 13 and all events on Wednesday-Saturday, Feb. 13-16 have been canceled. King County Library System: Some branches are open, while others are closed or on different hours. The Lake Forest Park and Newcastle branches open at 11 a.m. The Bellevue branch opens at noon. The Redmond and Woodinville branches close at 6 p.m. The Black Diamond, Boulevard Park, Carnation, Crossroads, Des Moines, Duvall, Fairwood, Fall City, Federal Way, Greenbridge, Kenmore, Kingsgate, Lake Hills, Maple Valley, Mercer Island, Muckleshoot, Newport Way, North Bend, Redmond Ridge, Renton, Renton Highlands, Richmond Beach, Shoreline, Skykomish, Skyway, Snoqualmie, Tukwila, Valley View, White Center and Woodmont branches are closed on Wednesday. Washington Baseball’s opening four-game home series originally scheduled from Feb. 22-24 at Husky Ballpark against Northern Colorado has been moved to Arizona. Several high school district basketball tournaments have been postponed or rescheduled. The Ladies Musical Club of Seattle has canceled its Wednesday concert at the Seattle Public Library’s Central Branch. All North East Seattle Together (NEST) events have been canceled through Thursday. Northwest Trek Wildlife Park’s Kids ‘n’ Critters event on Feb. 16-18 has been rescheduled for March 9-10. The park is closed until 9:30 a.m. Friday. The Delfonics performances at Jazz Alley on Tuesday and Wednesday, Feb. 12-13, have been rescheduled for Tuesday and Wednesday, April 30-May 1. Johnny Mathis’s performance at the Paramount Theatre on Wednesday has been rescheduled for Sunday, April 7.